In these markets Barco offers user-friendly imaging products that optimize productivity and business efficiency. Its innovative hard- and software solutions integrate all aspects of the imaging chain, from image acquisition and processing to image display and management. Barco has its own facilities for Sales & Marketing, Customer Support, R&D and Manufacturing in Europe, North America and Asia Pacific. Barco (NYSE Euronext Brussels: BAR) is active in more than 90 countries with more than 3,500 employees worldwide. Barco posted sales of 1.041 million euro in 2011. Barco acquires Belgium-based digital signage solutions company dZine, headquartered in Kortrijk. dZine is a pioneer in the development of digital signage systems and professional mobile solutions for retail, hospitality, transportation and corporate branding. Barco acquires the products, intellectual property rights and know-how of Element Labs. Element Labs, based in Santa Clara, California, manufactures LED video systems with a focus on mid-end market requirements in rental, staging and fixed installations. Barco acquires FIMI, a fully owned subsidiary of Royal Philips Electronics' Healthcare business, which is based in Saronno, Italy. Barco closed the divestment of its Advanced Visualization activities to Toshiba Medical Systems Corporation, Tokyo, Japan. Eric Van Zele appointed new CEO of Barco. Barco acquires Texas-based High End Systems, Inc., a global technology provider of automated luminaires, digital lighting and lighting controls. With the merging of two strong industry players, this acquisition reinforces Barco’s leadership position in the fast converging video and lighting segments. An agreement has been reached with IPTE on the sale of the Electronic Manufacturing activity of the division Barco Manufacturing Services. The transfer has become effective 1 January, 2007. An agreement has been reached with the shareholders of the private company Elprinta about the sale of the Prints activity of the division Barco Manufacturing Services. The transfer has become effective 1 January, 2007. In line with its strategy to focus further on its growth markets, Barco has decided to investigate the possibilities to divest the division BarcoVision, active in the markets of textile and production process optimization. Barco signs agreement with Italian Itema to divest its division BarcoVision. All the division’s operations are part of the acquisition agreement. Barco and BMTech reach agreement on the sale of the mechanical unit of the former Manufacturing Services division. The transfer will become effective on 1 January, 2008. With this sale, the divestment of the former Barco Manufacturing Services division is now complete. Barco and IPTE sign Letter of Intent concerning the possible sale by Barco of the Electronic Manufacturing activity of the division Barco Manufacturing Services. Barco and shareholdership Elprinta reach agreement about the sale of the Prints activity of the division Barco Manufacturing Services. Barco acquires business of System Technologies, based in Torhout, Belgium. System Technologies, to be incorporated by Barco Media & Entertainment, specializes in innovative designs for special projects in the Rental & Staging markets. The new name of the company is Innovative Designs. The acquisition of the business of System Technologies will allow Barco to move up the value chain and further strengthen its total solution offering to the Rental & Staging markets by catering to the design needs of the growing ‘special projects’ markets. Barco sells its Home Cinema activity to French TEC. 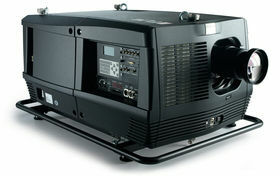 The Home Cinema activity of Barco was part of the Media & Entertainment division. Within Barco, the Home Cinema activity was the only one still focusing on the consumer market. This transaction enabled management to fully focus on the professional Digital Cinema market. Barco acquires Voxar, the leading 3D medical imaging software company, based in Edinburgh, Scotland. Voxar is fully integrated into Barco's Medical Imaging business unit and has become the worldwide center of expertise for 3D software products. Barco acquires Folsom Research, Inc, based in Sacramento, California. Folsom's product lines cover solutions for image processing, image communication and image functionality & interactivity. This acquisition further strengthens Barco's leadership in the Events market and its presence in the USA. Barco sells Machine Vision business unit, part of the BarcoVision division, to BEST (Belgian Electronic Sorting Technology) of Heverlee, Belgium. This transaction fits within Barco's strategy to concentrate on image processing, where the company can establish itself as a world leader. Barco acquires assets of U.S.-based Trans-Lux West and China-based Beijing LEYARD Electronics Technology Co. Ltd., in order to further strengthen position in full color LED (Light Emitting Diode) display market. Barco reduces share in Esko-Graphics from 49% to just below 20%, in line with strategy to focus on image processing. Martin De Prycker appointed new CEO of Barco. Barco Graphics de-investment process starts. ETS business unit, active in systems for production of printed circuits, enters into joint venture with parts of Mania Technologie AG to form ManiaBarco GmbH. Barco retains a 33% interest in this joint venture. Commercial Printing and Packaging Systems merge with Purup-Eskofot in the new company Esko-Graphics. Contract for this merger was signed late 2001. Barco retains a 49% interest in Esko-Graphics. Industrial Printing is incorporated into dotrix n.v., in which Barco has an interest of 88%. Here too, Barco is open to taking on a financial partner. Barco becomes a Next 150 company. The Barco group, (without BarcoNet, split off in the second half of 2000) realizes a turnover of euro 751 million. Barco listed on the BEL-20 index of the Brussels Stock Exchange. In the nineties Barco becomes a truly global company, with acquisitions and subsidiaries in many countries. January 1, Barco Electronic and Barco Industries merge into a single, international electronics group with worldwide ambitions. Barco Electronic and Barco Industries quoted on the Brussels Stock Exchange in 1986 and 1987. Barco split into two separate companies, Barco Electronic (consumer electronics) and Barco Industries (high tech electronics for visualization and process control). Many other industrial projects, with focus on high tech electronics. Second diversification project: Barco supplies the BRT (Belgian national broadcasting station) with studio monitors in conformance with the most stringent norms. The technical perfection of these systems attracts customers from all over the world and an international network of distributors is set up. First diversification project: development of an automatic control system for a neighboring manufacturer of weaving looms. Barco radios are a big success and results in increased turnover. This allows Barco to make the necessary investments to pick up with a new revolution in communication: television. Barco established in Poperinge, Belgium by Lucien De Puydt. 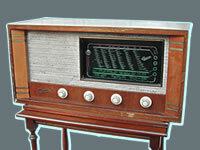 The company specializes in the assembly of radios with parts from the United States. Hence the name, "Belgian American Radio Corporation" or Barco.